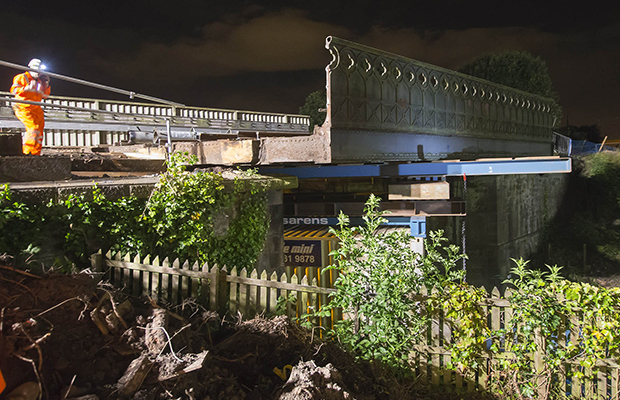 Tyne and Wear Metro operator Nexus has started major work to replace an ageing railway bridge. The Victorian era bridge over Killingworth Road, Gosforth, is being replaced by a new steel bridge as part of a £5.5 million scheme. Story Contracting removed the bridge deck in the early hours of August 1. It used a specialist wheeled rig to lift the deck clear of the bridge’s abutments and into a nearby site. The old concrete abutments will be demolished before new ones are constructed. The new bridge deck, which is currently at the site compound, will be moved into place and secured in August. The Metro line between South Gosforth and Four Lane Ends closed as a result on July 31. This closed area is to be widened from August 11 to Shiremoor. Metro services will return to normal on September 3. The project has been funded by the government’s Highways Maintenance Challenge Fund.